Top 10 Things To Do in St Maarten - Caribbean & Co.
There’s no way to describe the sheer beauty and magic of St. Maarten. This breathtaking little 17-square-mile country is unique in many ways, and it’s not to be missed if you’re visiting the Caribbean. But before detailing the top ten list of things to do in St Maarten, a bit of background about this beautiful Caribbean island. St. Maarten is the southern half of the island Saint Martin, and it shares an easily traversable border with Saint-Martin, the French collectivity to the north. Once a member of the Netherland Antilles, St. Maarten is now a semi-autonomous country within the Kingdom of the Netherlands. Although locals speak mostly English, Dutch culture can still be seen everywhere in St. Maarten. The official language is Dutch, and the oldest roads are lined with charming European-style houses with white gingerbread trim. Recent decades have transformed this once-quiet region into a busy tourist area, but the real charm of St. Maarten is the natural world. You could spend days exploring the “chains of mountains green,” as described in the national anthem, along with the beautiful beaches and underwater fantasylands. 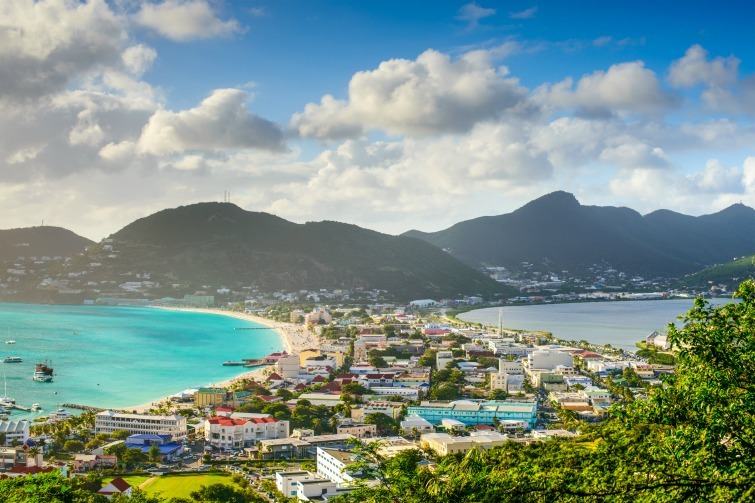 If you’re looking for a vacation destination with cultural diversity, nightlife, dining, outdoor activities, and plenty of sunshine, St. Maarten is the perfect place for you. So where do you start? Fortunately for you, I have spent the last two years living and loving every inch of this island, and I can share the best of its many experiences! 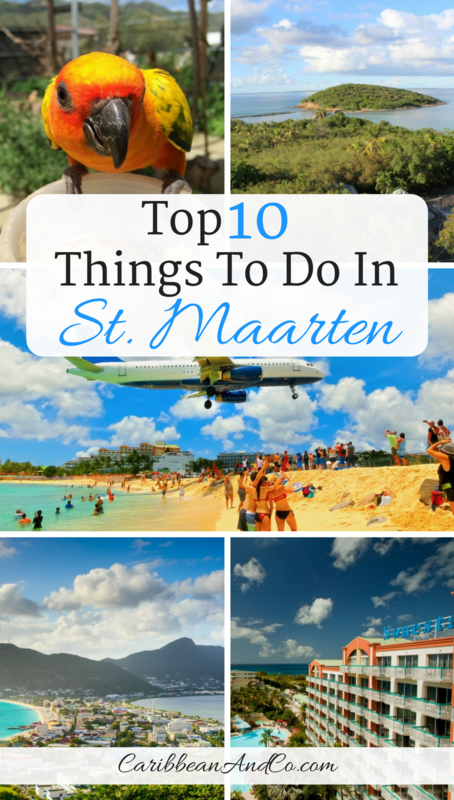 Here are my top ten things to do in St Maarten. The island allegedly has 37 beaches (I’ve only counted 35), and people often ask me which of St. Maarten’s beaches is the best. Although Great Bay gets a lot more attention from the tourists, the locals know right where to go: Mullet Bay Beach. Here, there are a couple of snack shacks with decently priced beach food, plus chairs and umbrellas to rent. If you walk to the opposite end of the beach, you’ll find a quiet area with just a few people soaking up the rays. On calm days, you can snorkel here, and on rough days you can skim board and sometimes surf. Not many tourists know about this cool little attraction, but it’s one I love to take my Little League kids to. For a small price, you can walk through an enclosure with hundreds of tropical birds! You also get a cup of bird feed to tempt the birds to alight on you. If you ask nicely, the owner, George, will give you a tour of the medicinal plants he grows inside the enclosure. He also has a small culture museum, a rare find on the island. 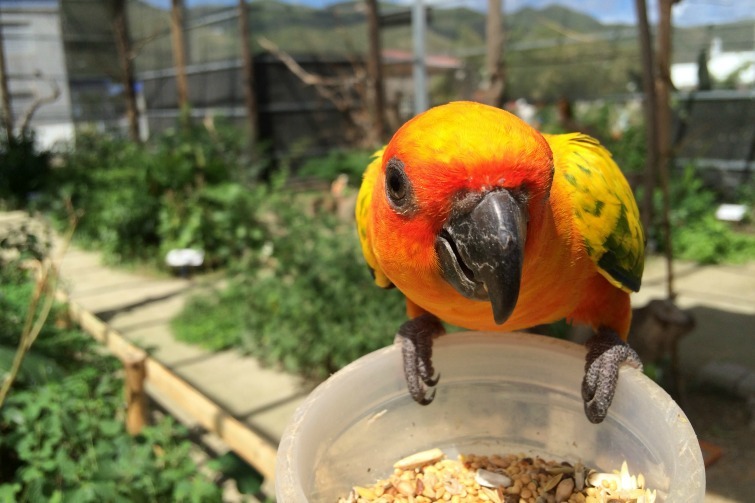 St. Maarten: Parotte Ville Bird Park. Photo Credit: © Breana Johnson. 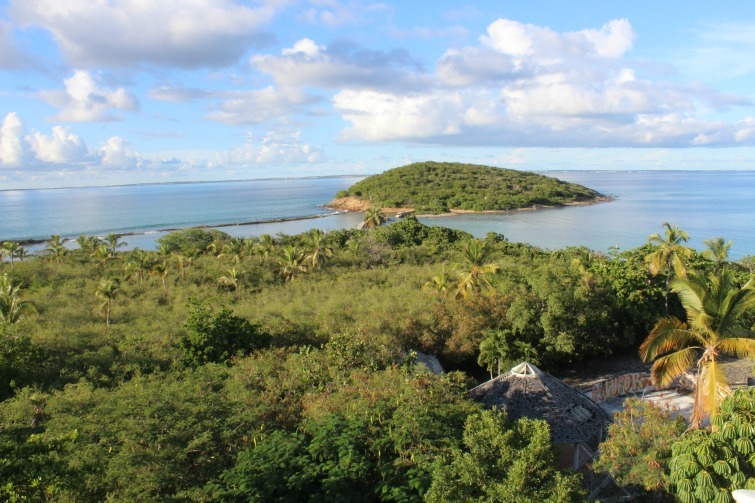 The Guana Bay hike is popular with locals, but tourists rarely find themselves here. Located on the eastern shore of St. Maarten, it’s a bit hard to find unless you’re looking out for it. When it’s rainy season, the area will be green and full of papery white butterflies; in the dry season, it looks like a high desert. Any time of the year, you’ll get views of the nearby islands. The hike leads to natural tide pools, where you can swim, snorkel, or sunbathe. 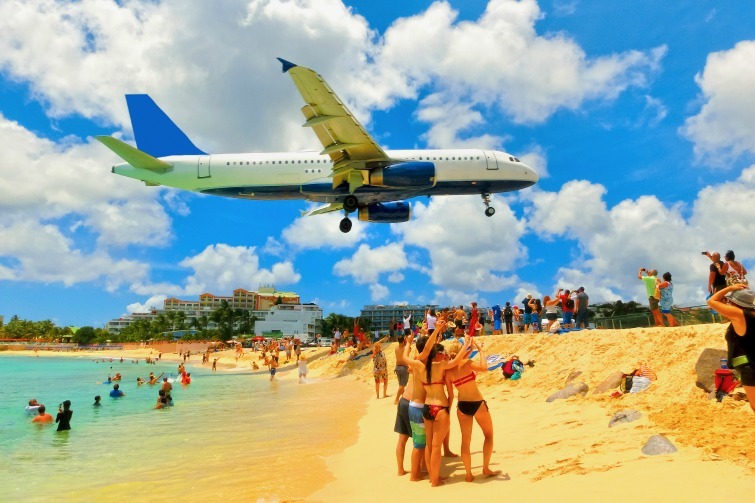 Maho Beach is the single most famous attraction making it one of the top ten things to do in St Maarten. You’ve probably seen photos of it somewhere online. This is the beach where large planes come flying in for landing just a few hundred feet overhead! You can also stand on the beach and get blasted by a jet engine about to take off. The process is a bit painful, but it’s a St. Maarten vacation rite of passage. Sadly, the iconic KLM 747 no longer lands in St. Maarten but you will get sufficiently sandblasted by any of the other jets, though. St. Maarten: Maho Beach. Photo Credit: © Solarisys / Adobe. Believe it or not, the creator of Star Wars’ Yoda lives right here in St. Maarten, where you’d least expect it. He has a museum and art gallery in downtown Philipsburg where he displays his work and many pieces of Star Wars memorabilia. For ten bucks, you can walk through the museum and see stuff like an original Storm Trooper helmet. At the end (if you’re lucky), Nick Maley himself will be working away at his office at the end of the tour. Shake his hand and snap a photo! How often do you get an opportunity like that? This is a system of hiking trails that go through both the French side and the Dutch side. Although there are plenty of hikes on the island, this one doesn’t get a lot of love, probably because there is currently no parking at the trailhead. It’s still worth it, though! You can take a variety of trails, either staying flat or climbing up to get a great view of the airport and the lagoon. Sometimes, you can see a monkey or two! The trailhead is exactly straight ahead of the causeway bridge. You can park at Carrefour Market and walk to the trails. St. Maarten: View from Belvue hike. Photo Credit: © Breana Johnson. St. Maarten is filled with fun watersports activities, and one of the best is jet skiing. If you like getting wet and going fast, this is a great activity to spend a little money on. You can jet ski around the island, but it’s a lot of fun to zip through the lagoon. The vast Simpson Bay Lagoon is a beautiful place, and it offers great views of the mountains, sailboats, and yachts on the island. Downtown Philipsburg is billed as the best place to find jewelry or Guavaberry Rum, but locals know what it’s really good for — the food. By all means browse the Tanzanite bracelets, high-end makeup, art galleries and souvenir shops on Front Street, but be sure to leave some time for tasting the local food on Pondfill Road. Fat Jimmy’s Roadside Barbeque serves a casual dinner, and the best local lunch in town can be found at an unnamed restaurant that advertises Banks beer and a $5 lunch. Whatever you order, be sure to supplement it with a johnny cake. St Maarten: A view of capital Philipsburg from the Great Salt Pond. Photo Credit: © SeanPavonePhoto / Adobe. One of the oldest structures in St. Maarten is Fort Amsterdam. It was built in 1631 to defend the Dutch colony from the Spanish and was used for many years to keep unwanted visitors out of Great Bay. Although it was repurposed and finally abandoned, the fort has just recently been resurrected as a monument to the past. Located on a small hill beyond Divi Little Bay resort, is offers a sweeping ocean view and a perfect place to watch the sunset. The site has part of the battlements, an old house, and a few historic canons remaining. It’s also the site of a pelican nesting ground and nature walk. If you want to spend a day enjoying the luxe life, there’s no better place to do it than the all-inclusive resort in Maho, Sonesta. You can while away the day lounging by the pool, drinking unlimited alcoholic beverages, dining, or lounging on the beach. The dining patio has an excellent view of planes flying over Maho Beach, and there’s a kids’ pool where you can take your little ones for some fun in the sun. St. Maarten: Sonesta Maho Beach Resort & Casino. Photo Credit: © Sonesta International Hotels Corporation. 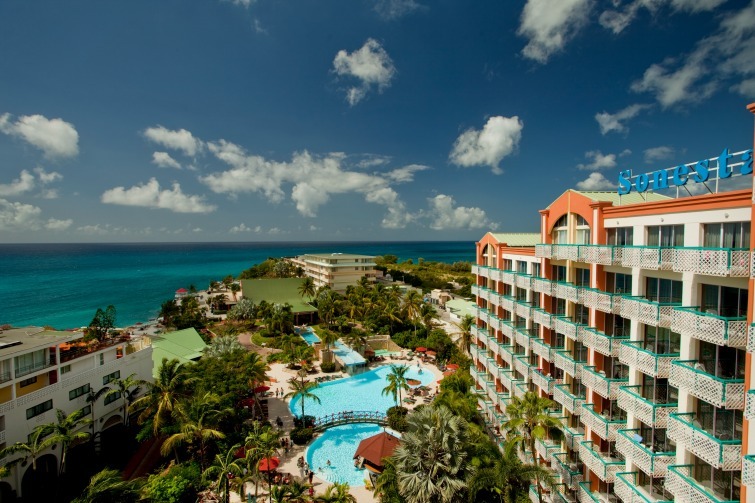 So which of these top ten things to do in St Maarten will you be checking out? Hopefully one or more. That said, for flight and hotel deals to St Maarten and the rest of the Caribbean, check out our Caribbean travel partner, Expedia.com. Breana Johnson is a med school wife and foster mom living on the Caribbean island of St. Maarten, where she hikes, snorkels, and coaches little league. Her blog is www.3rdculturewife.com.